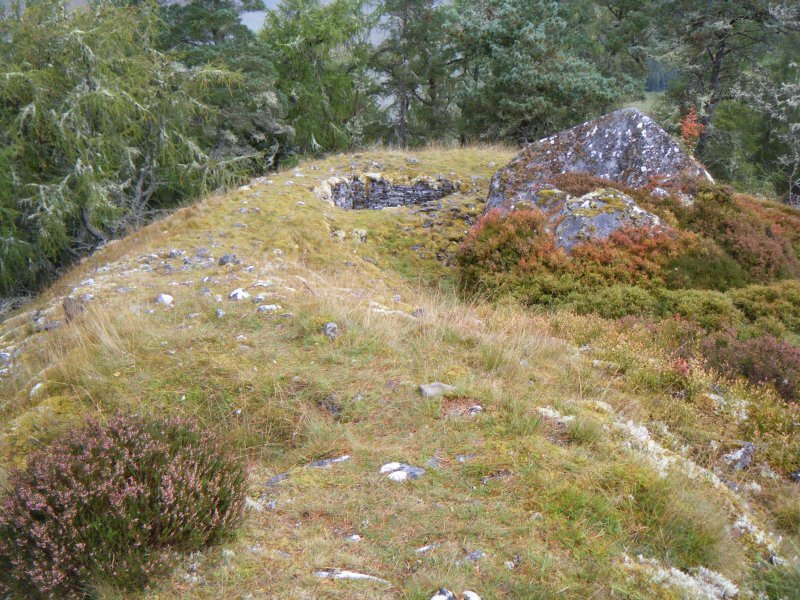 Inked plan: fort at Dun-da-Lamh. 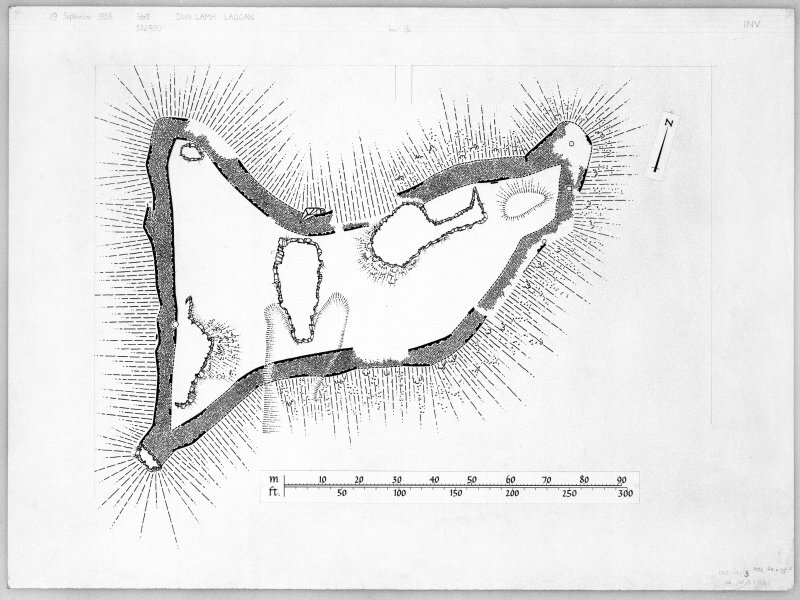 Based on 1956 survey. 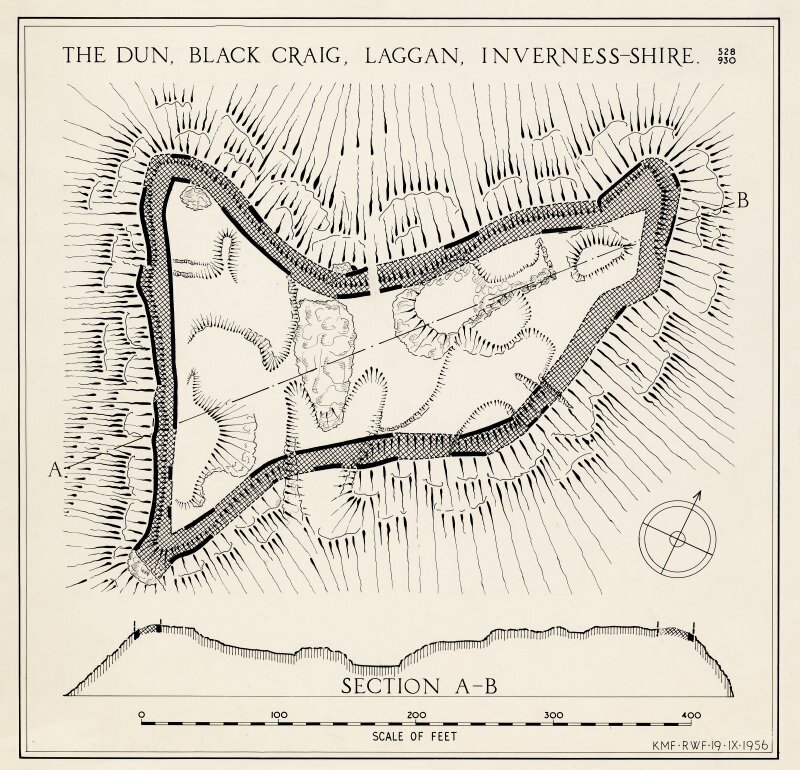 Inked plan: 'The Dun, Black Craig, Laggan, Inverness-shire'. 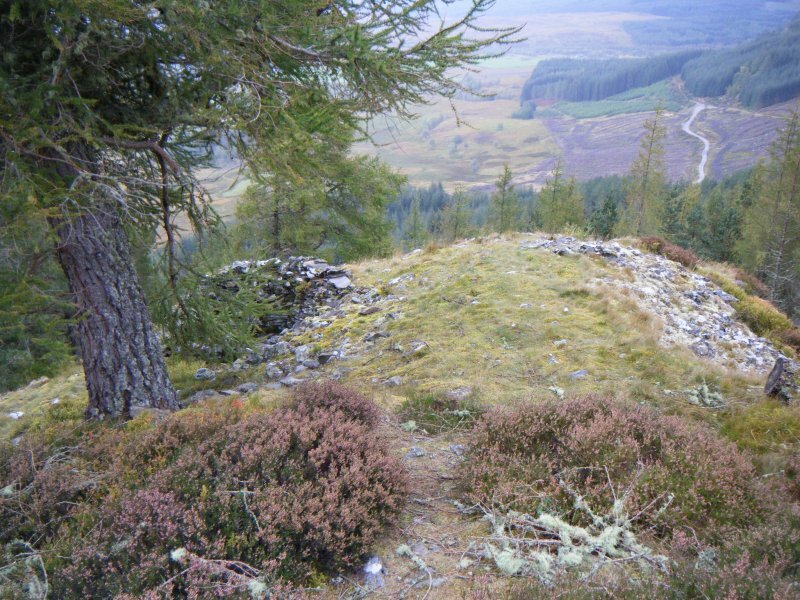 Fort, Black Craig, Laggan: Black Craig is a rocky eminence the summit of which attains a height of 1,484 OD and stands 600ft above the level of the ground a quarter of a mile distant. 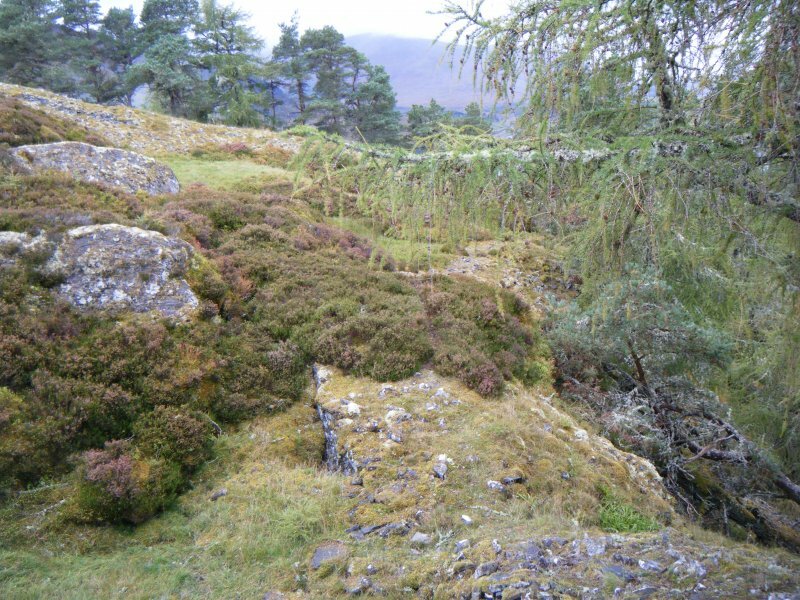 The sole defence is a stone wall, the faces of which have recently been cleared in places. 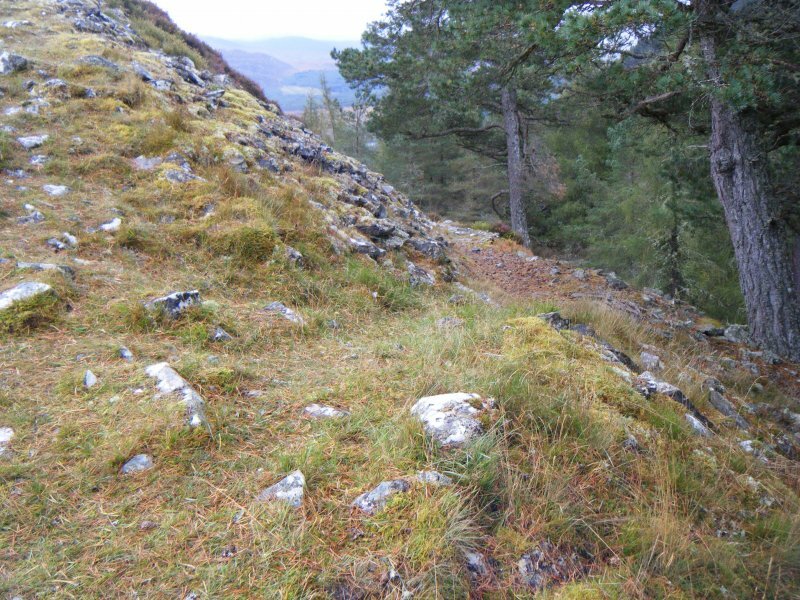 The uneven nature of the ground has meant that the distance between the inner and outer faces varies from place to place, the limits recorded being 13ft and 23ft. 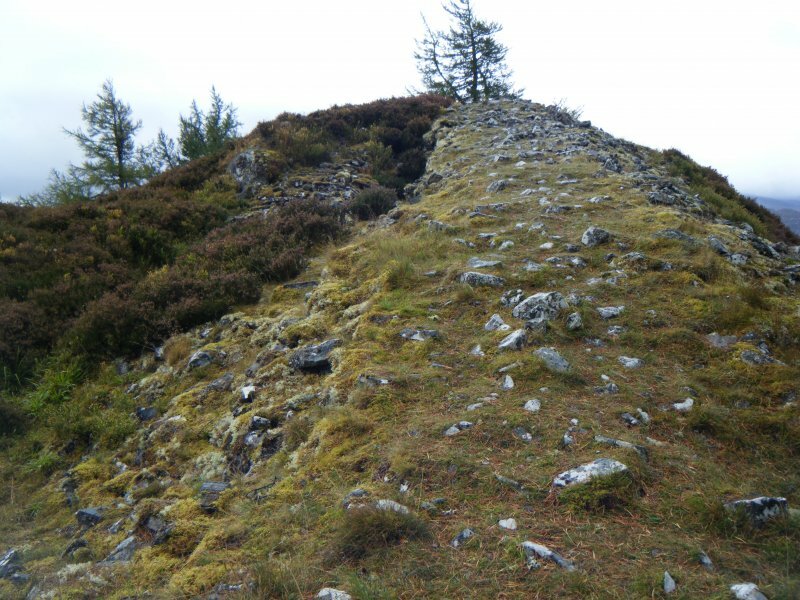 The WSW section of the wall runs for a little more than 300ft athwart the line of approach, cutting off the promontory which consists of two elevated areas and the depression between them. 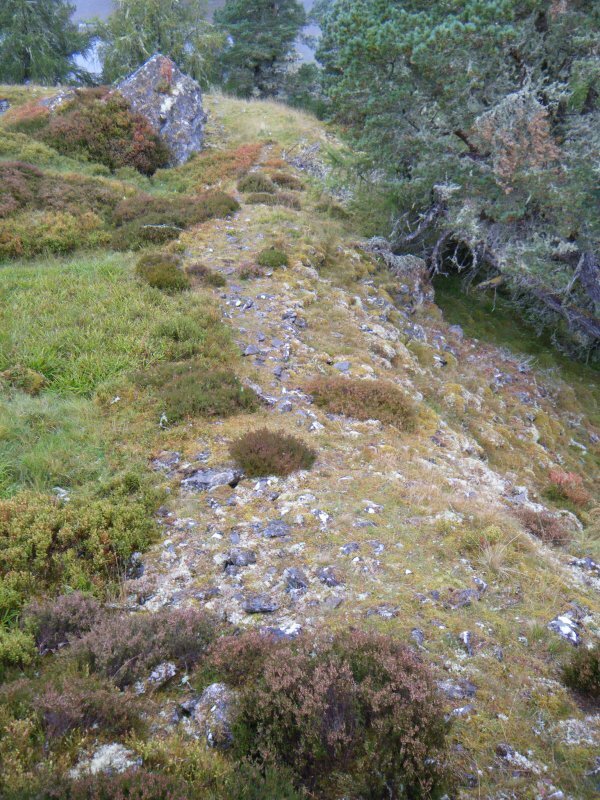 A point about the middle of this stretch has been used in modern times as an entrance, an engineered pathway being directed up towards it from the col, but enough of the inner and outer faces of the wall can be seen on the surface to make it reasonably certain that originally there was no entrance at this point. 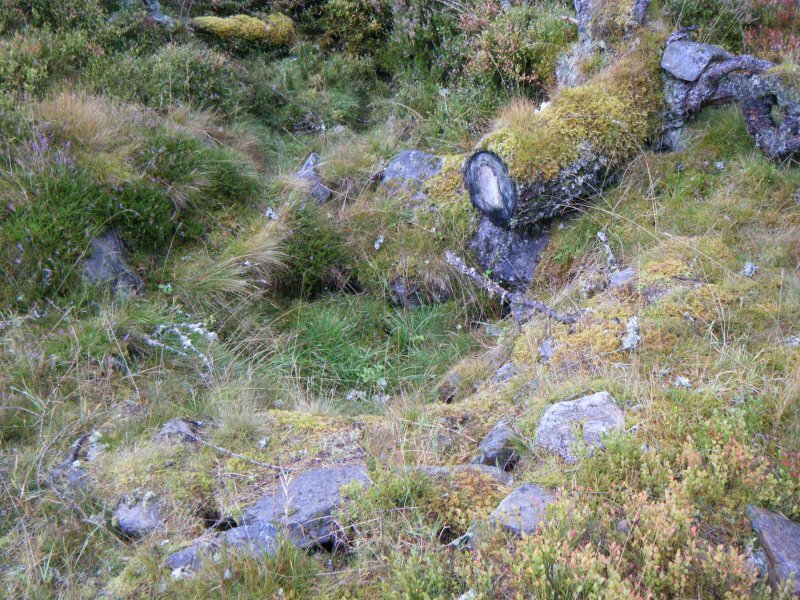 The only unquestionable gap is in the middle of the NW part of the wall, and this leads directly into the central depression. 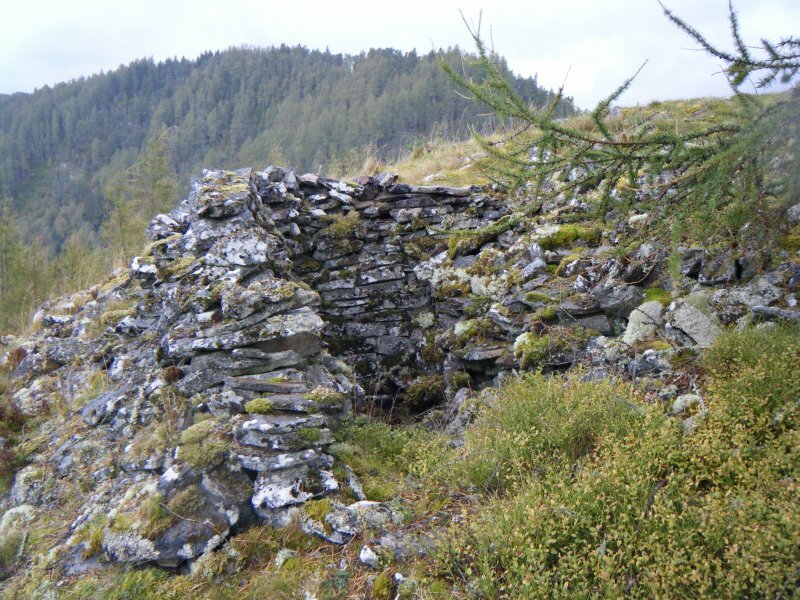 The stones of the wall are small and while the remote situation may have acted as a degree of protection against casual or systematic stone robbers, the condition of some parts of the wall is remarkable. 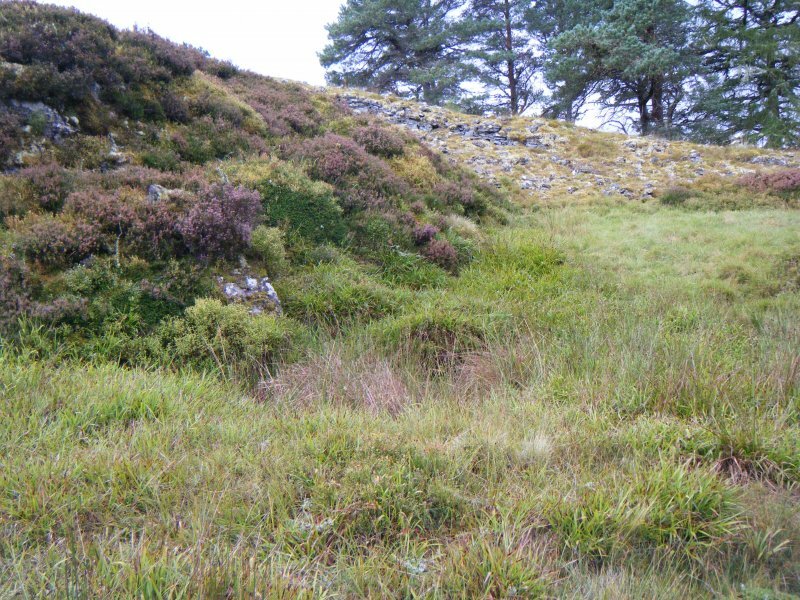 At the W apex, for example, the inner face of the wall stands exposed to a height of over 6ft, while the outer face in the middle of the SE sector reaches as much as 9ft. 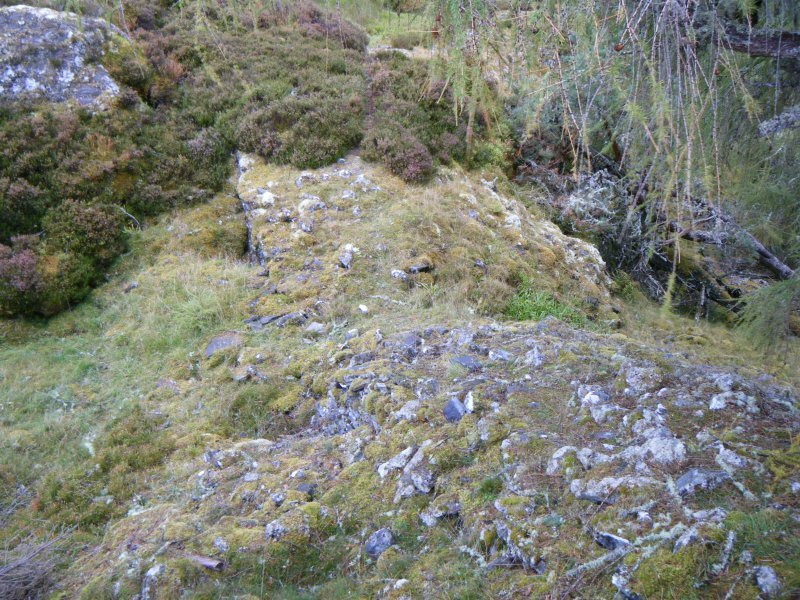 The interior is, as may be seen from the plan, occupied by different levels of rocky bosses and courts. 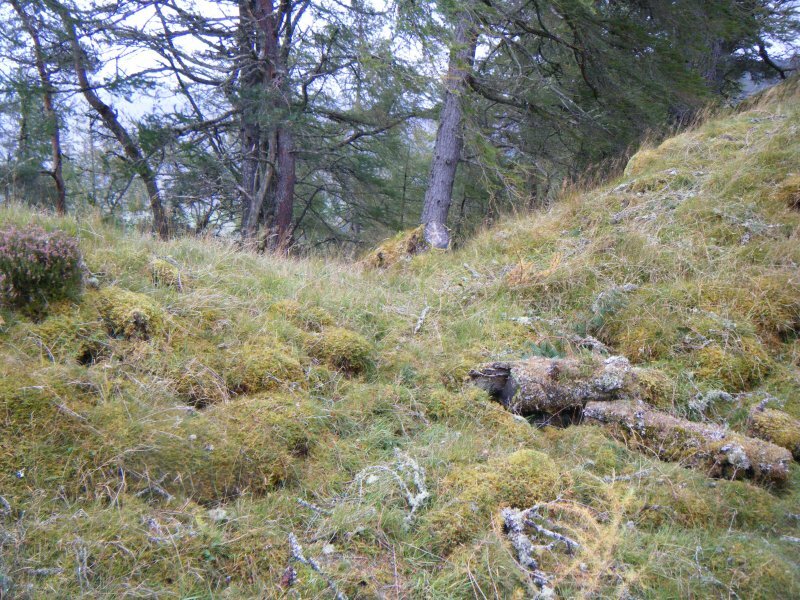 It is impossible from surface observation to say to what extent these may have been altered by the fort builders, but it is very probable that such terraces as those NE of the central depression supported dwellings. 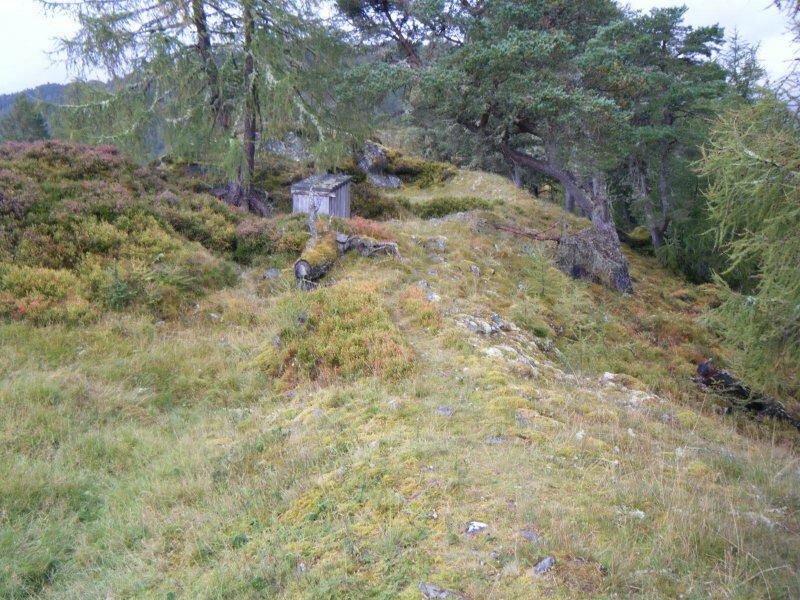 A dug-out of the kind made by the Home Guard in the 1939- 45 war is situated in the S apex, and a cairn stands near it on the line of the inner face of the wall. 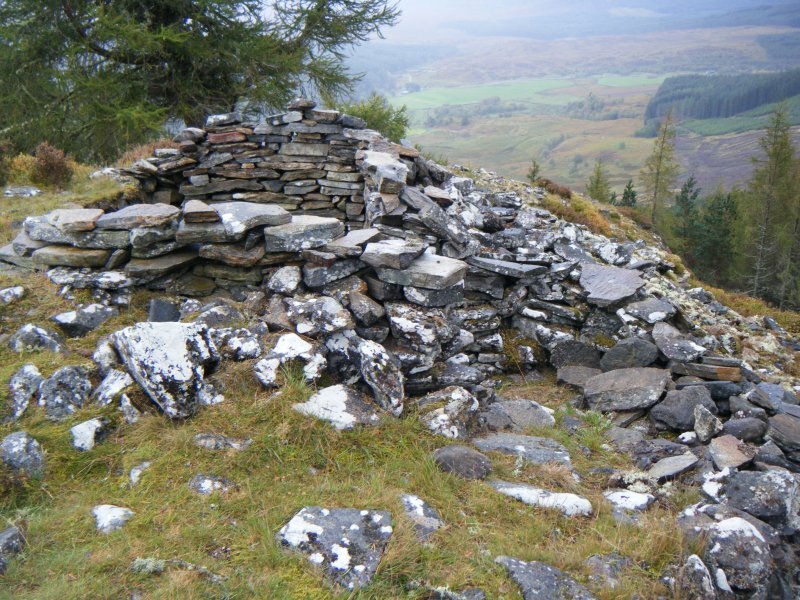 Three other cairns stand on the debris of the wall near the N apex. 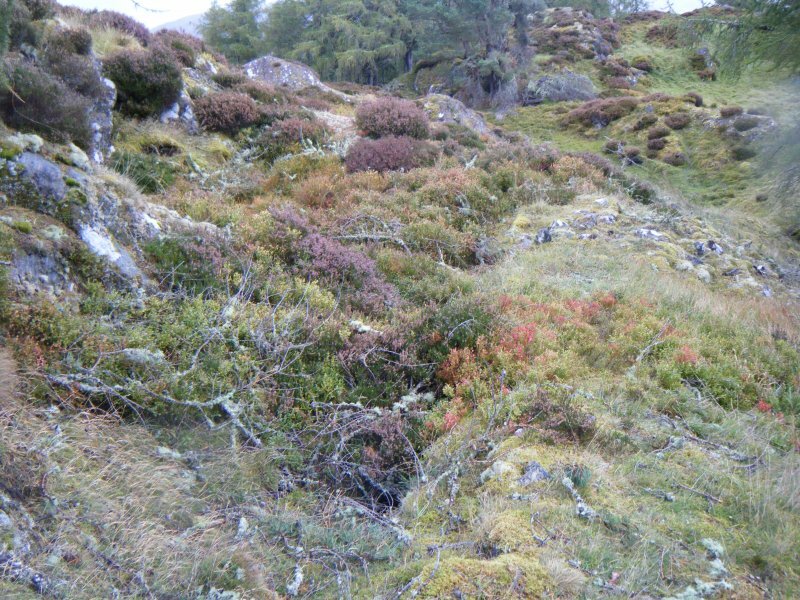 T Wallace 1921; M MacKay 1857; Infomation from RCAHMS MS (R W Feachem, 19 September 1956). Dun-da-Lamh or Black Craig is generally as described above. 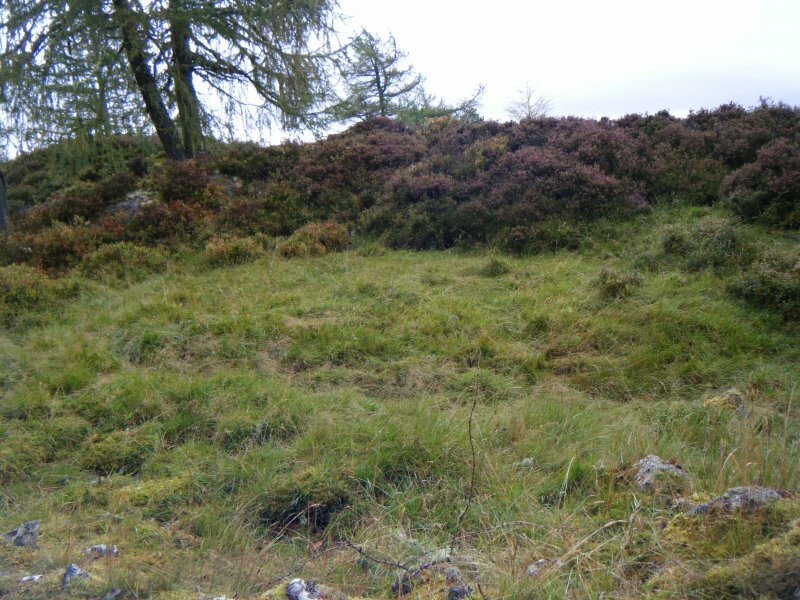 The enclosing wall survives to a maximum internal height of 2.5m in the NW corner, where the tumble has been cleared, and to a maximum external height of 2.2m in the S.
Visited by OS (N K B) 12 October 1965. 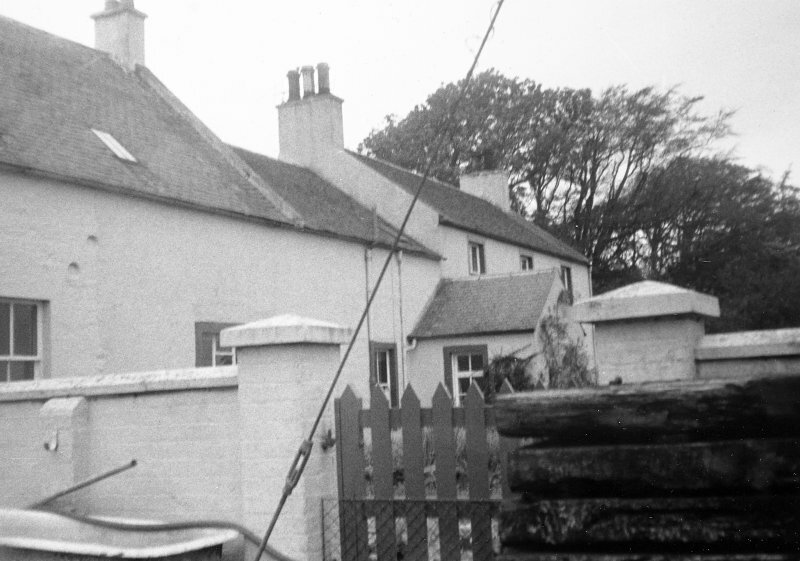 Visited by OS (J M) 28 February 1979. 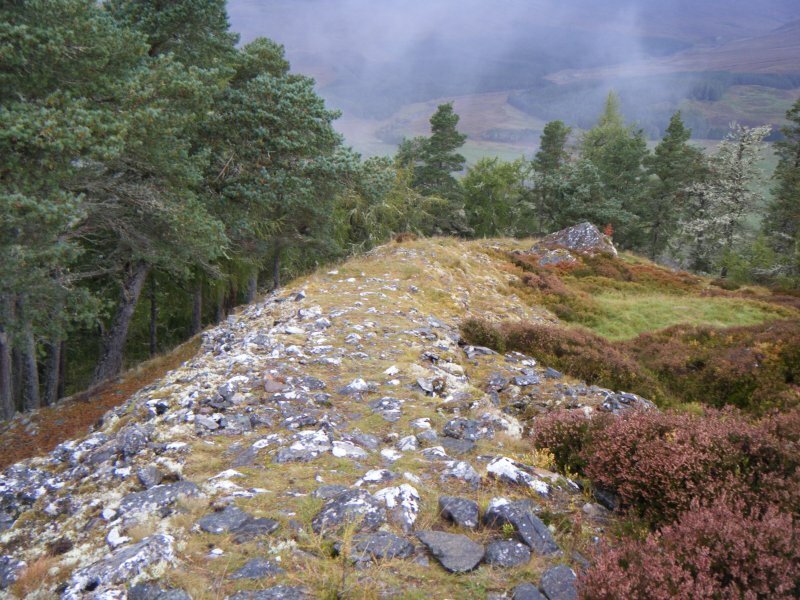 The fort is built on a knoll at the east end of a long, steepsided ridge known as the Black Craig, and is divided from the main ridge by a saddle. 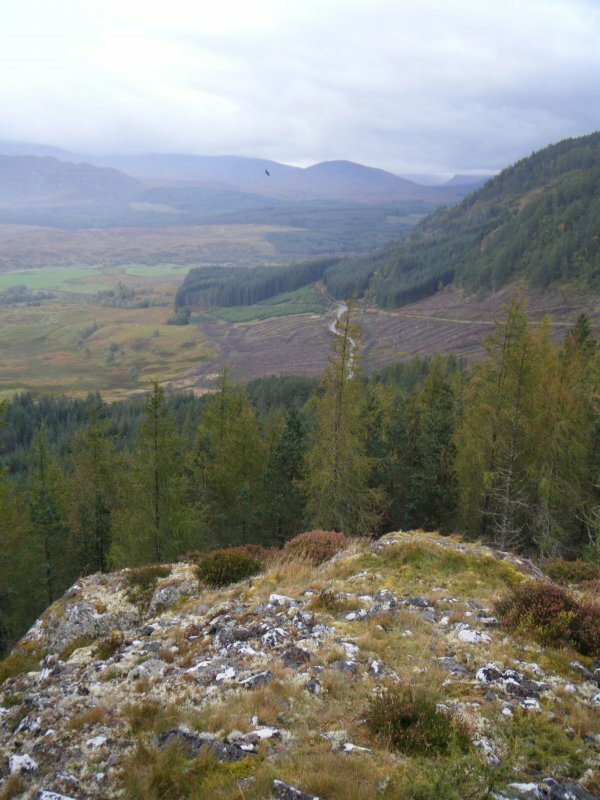 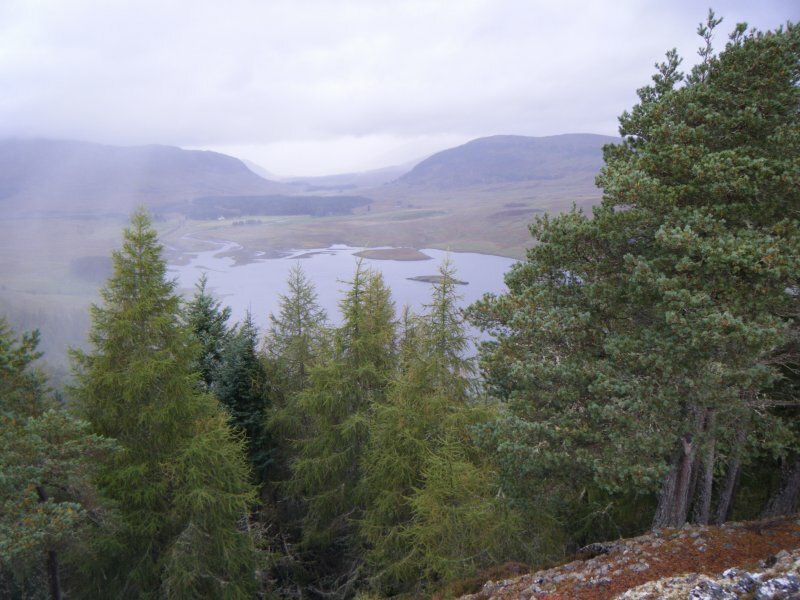 Standing some 200m above the valley floor, it has extensive views over upper Strathspey and Strathmashie. 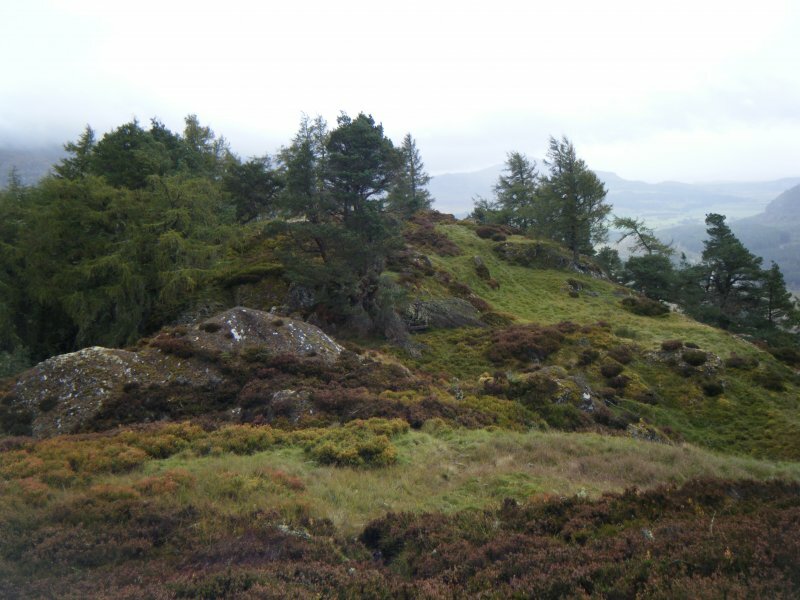 The knoll has two craggy summits with a lower area between, now overgrown with tall grass and heather: its Gaelic name (pronounced 'dun da larve') means 'fort of the two hands' and may refer to the two summits. 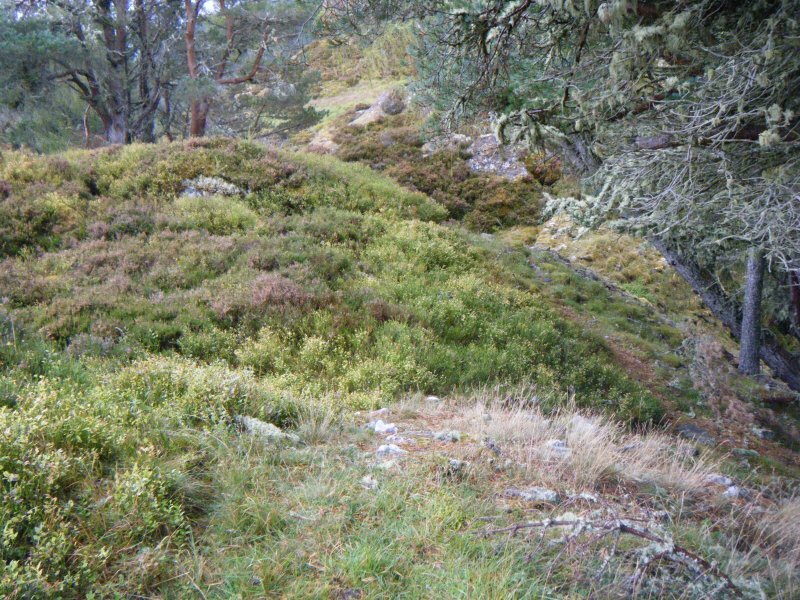 The rampart does not follow a level contour round the hill, but climbs up and down with the crags, and it was unusually massive, varying in width from fout to six metres or more; it is now tumbled and lichened. 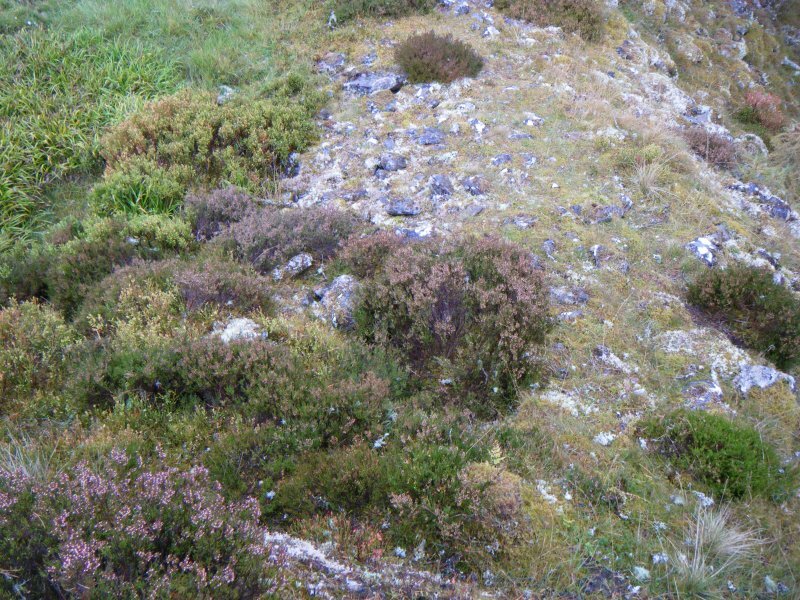 The inner face of the wall has been exposed at the northwest and southwest corners by the removal of tumble, showing the fine quality of the masonry built with small slabs (however, unless covered over soon, this face will itself deteriorate). 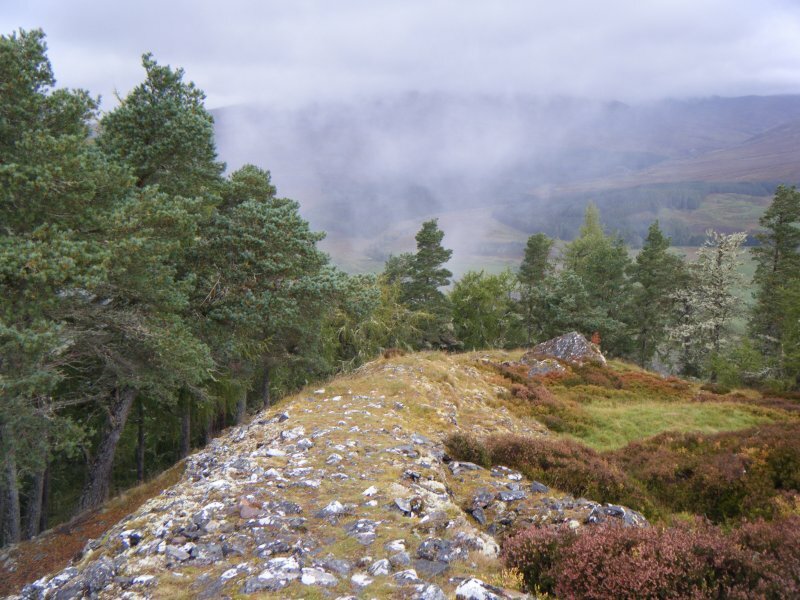 Because of the odd shape of the hill, the fort has pronounced corners, The fort is built on a knoll at the east and of a long, steepsided ridge known as the Black Craig, and is divided from the main ridge by a saddle. 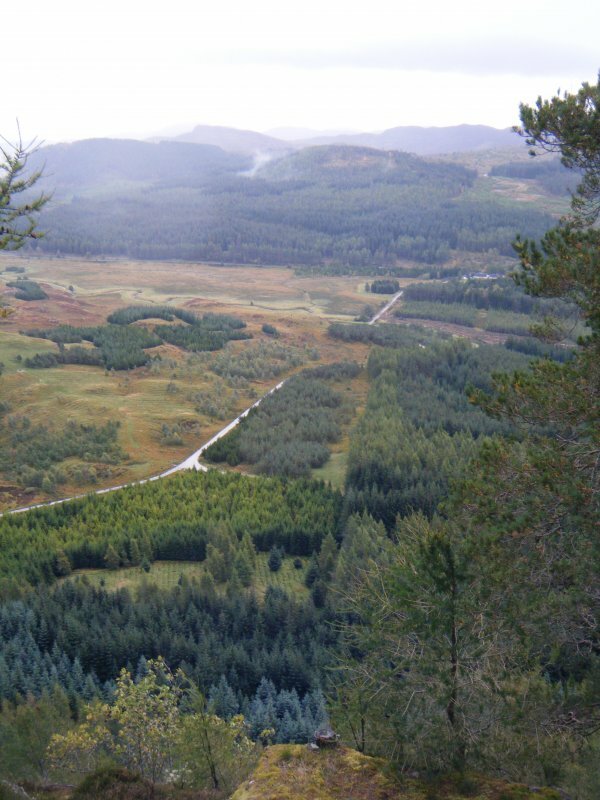 Standing some 200m above the valley floor, it has extensive views over upper Strathspey and Strathmashie. 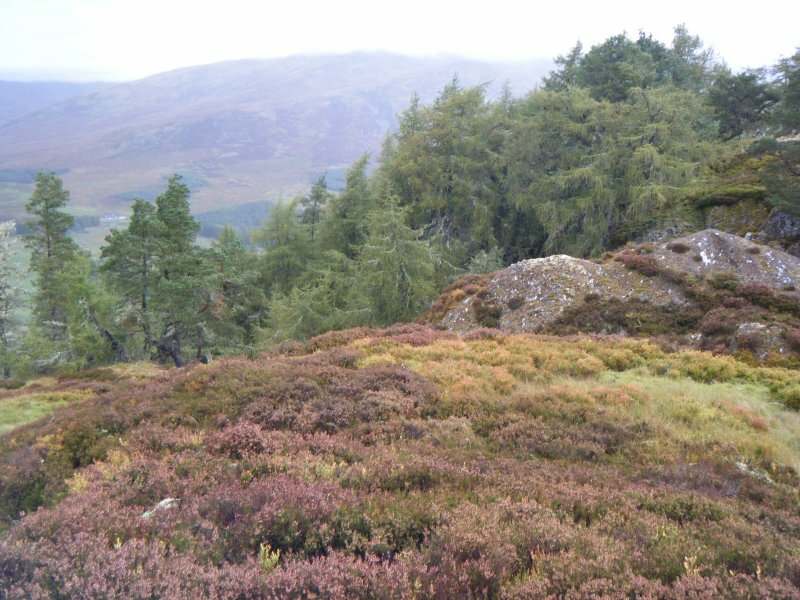 The knoll has two craggy summits with a lower area between, now overgrown with tall grass and heather: its Gaelic name (pronounced 'dun da larve') means 'fort of the two hands' and may refer to the two summits. 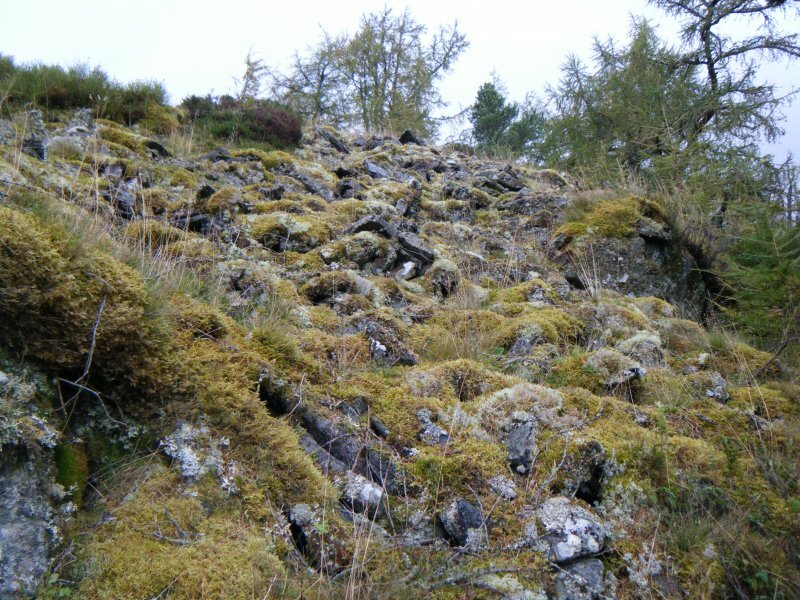 The rampart does not follow a level contour round the hill, but climbs up and down with the crags, and it was unusually massive, varying in width from four to six metres or more; it is now tumbled and lichened. 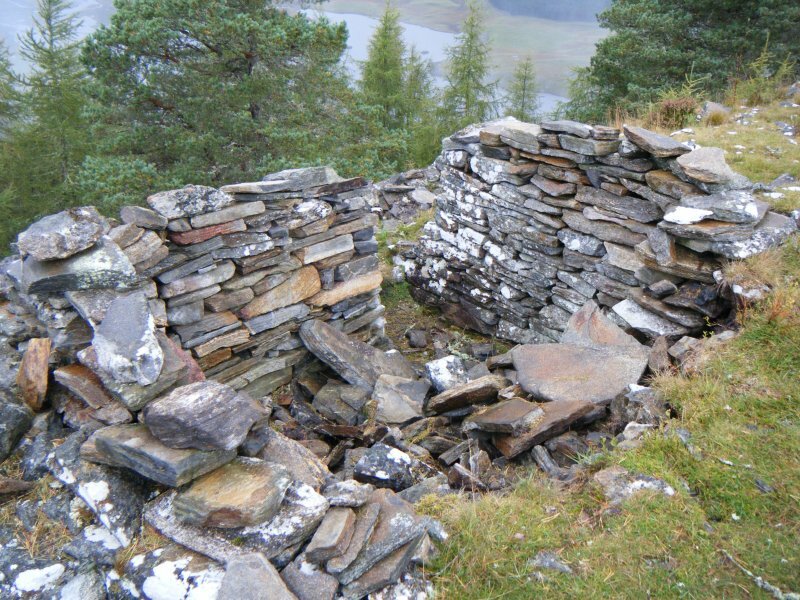 The inner face o f the wall has been exposed at the northwest and southwest corners by the removal of tumble, showing the fine quality of the masonry built with small slabs (however, unless covered over soon, this face will itself deteriorate). 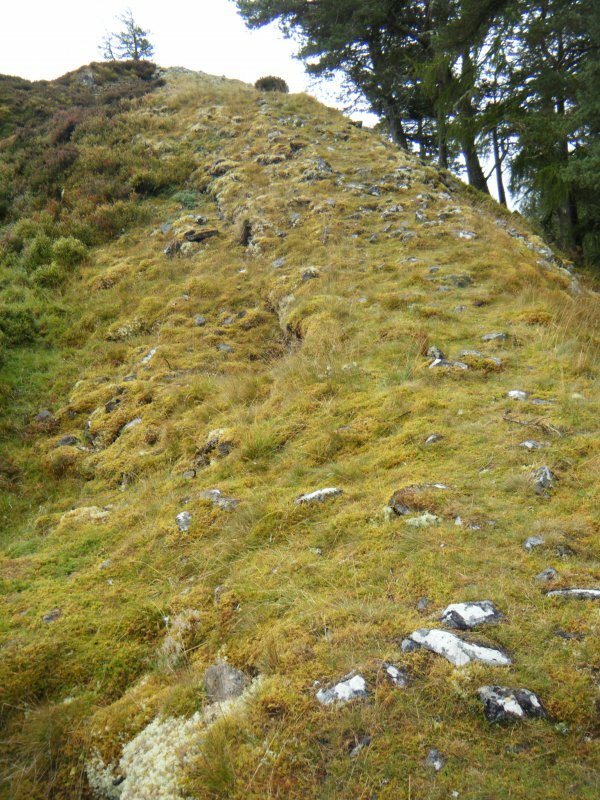 Because of the odd shape of the hill, the fort has pronounced corners, with angles skilfully constructed on the inner side of the wall. 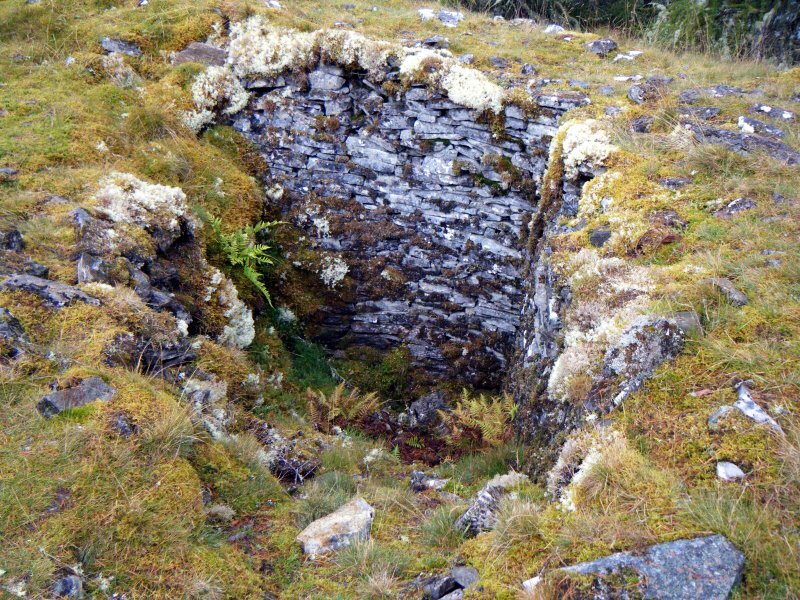 The original entrance may have been in the middle of the north wall where there seems to be a gap. 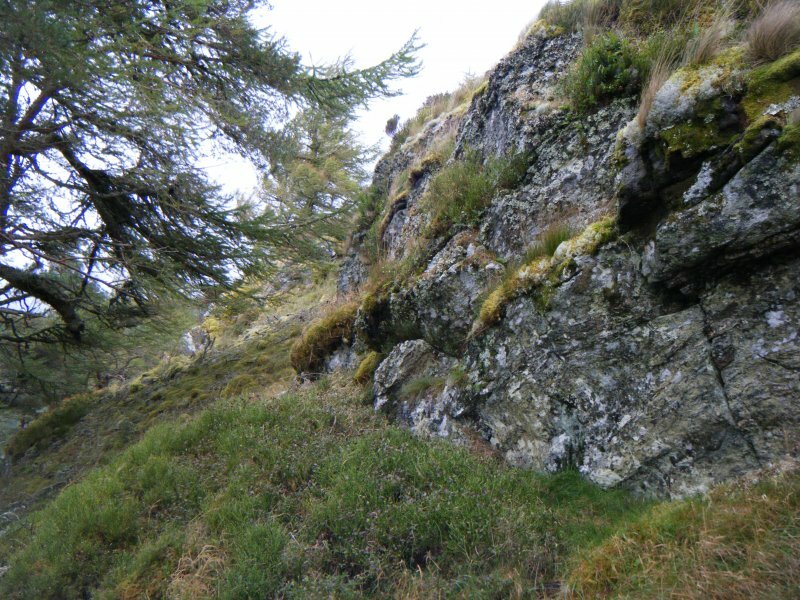 The position of the fort on such a craggy knoll and the use of rock outcrops suggest that this fort may be of early historic date, perhaps contemporary with fortifications on crags in the south of Scotland, such as Dumbarton Rock near Glasgow, Dunadd in Argyll and Dundurn, Perth and Kinross District. 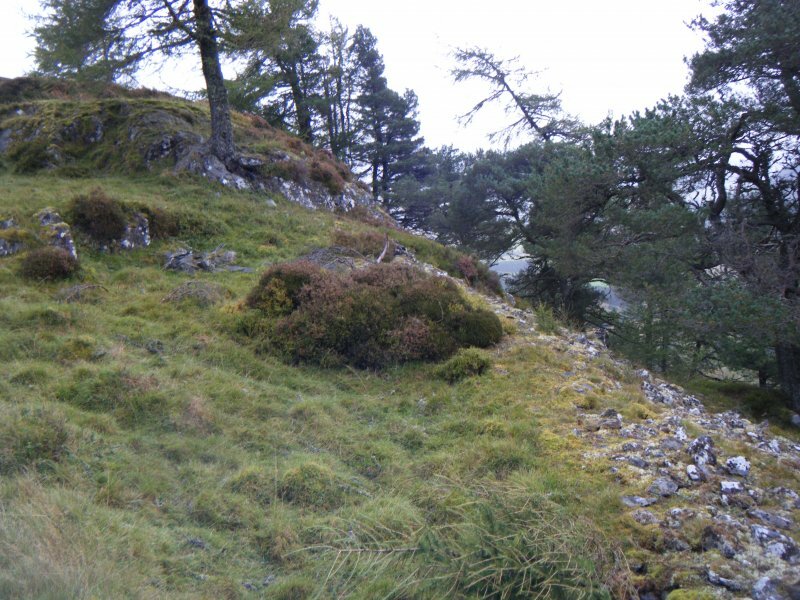 NN 582 929 A topographic survey of Dun da Lamh hillfort (NMRS NN59SE 3) was undertaken in March 2002. 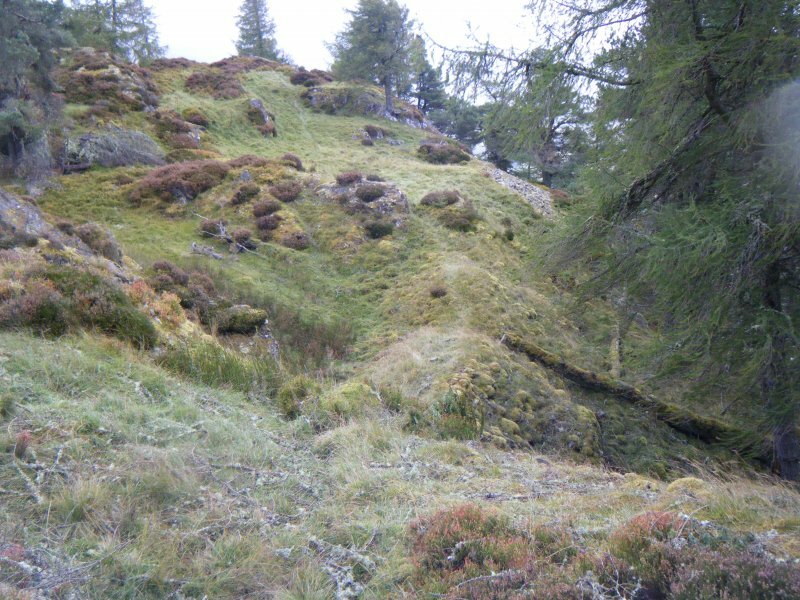 The survey was carried out to produce a plan to aid interpretation and management of the site. 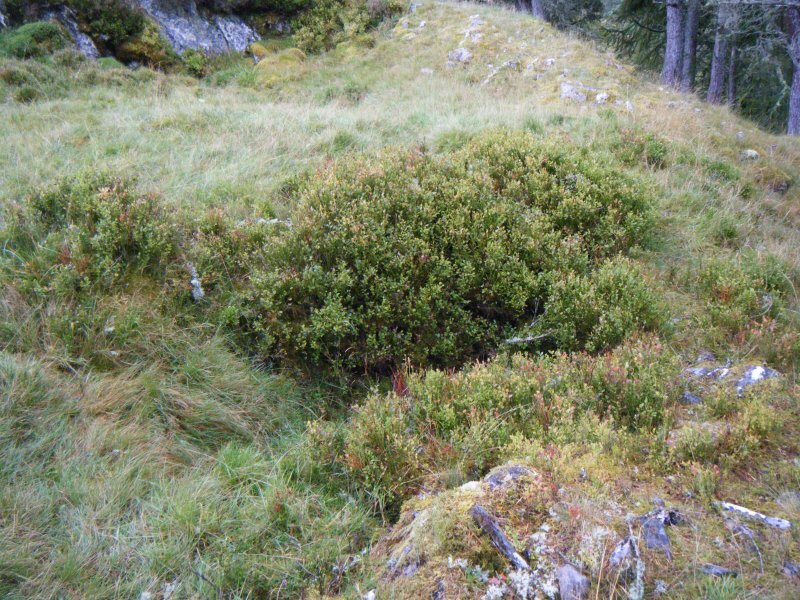 A total of nine sites or groups of sites were identified during the course of the field survey; only two of these may be contemporary with the use of the fort. 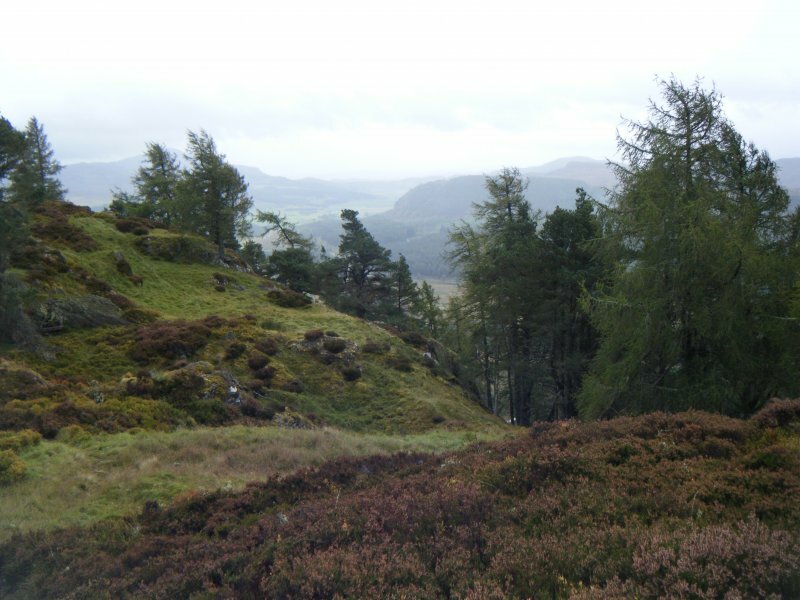 (Archive to be deposited in the NMRS). 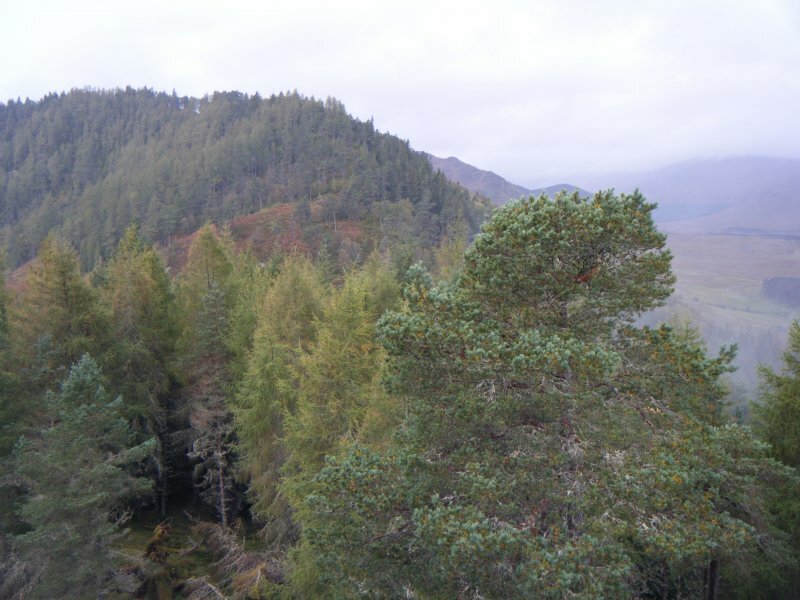 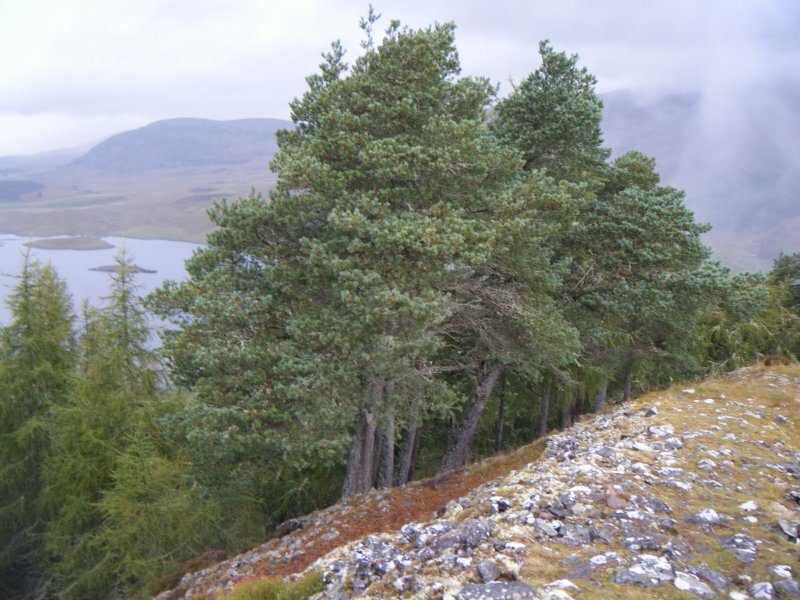 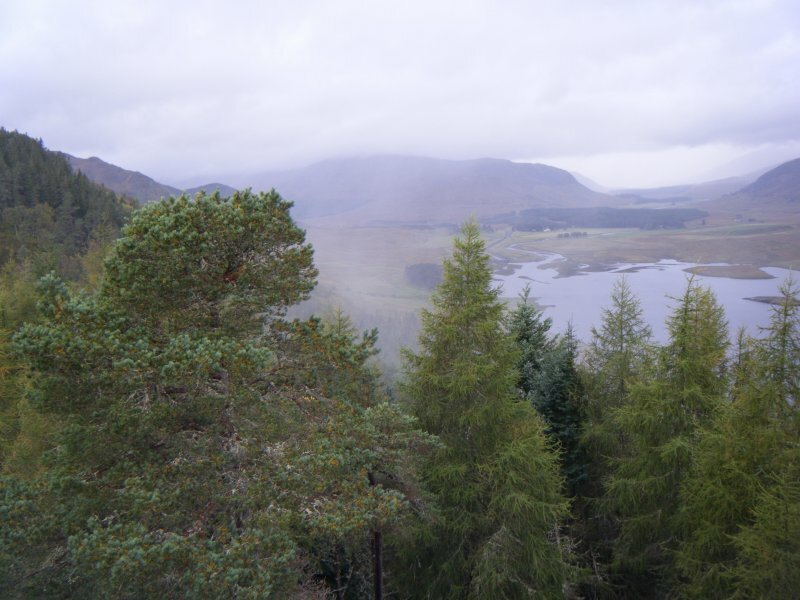 Sponsor:	Laggan Forest Trust Forestry Company Ltd.
A topographic survey of five hillforts on Forestry Commission land was undertaken in September 2010, and completed in February 2011. 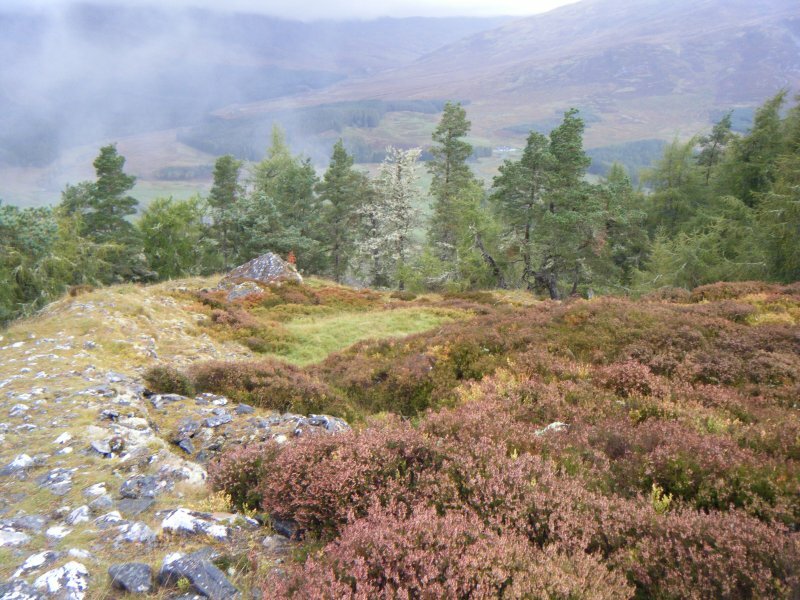 The forts surveyed were: Caisteal Mac Tuathal, Kenmore (NN 7790 4765); Dun da Lamh, Laggan (NN 5823 9295); Dun Deardail, Fort William (NN 1270 7013); Tor Dhuin, Fort Augustus (NH 3485 0693) and Craig Phadrig, Inverness (NH 6400 4528). 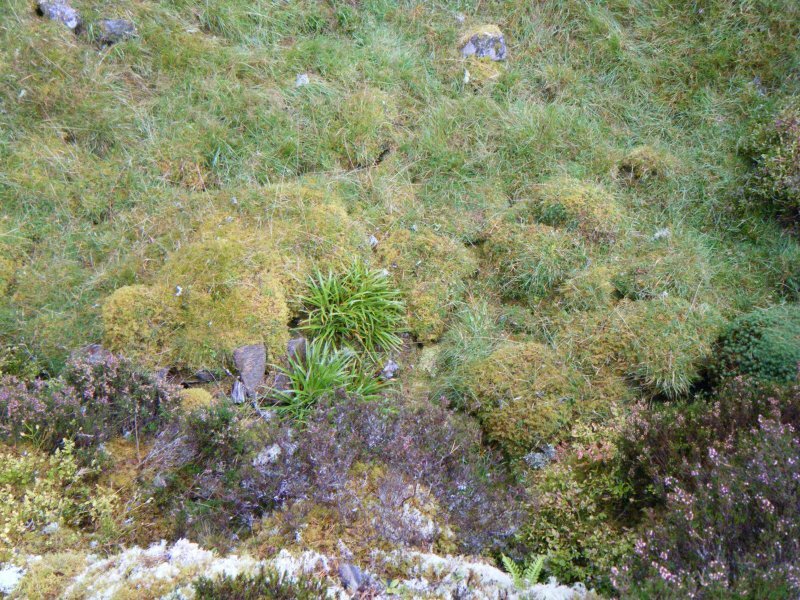 The survey aimed to produce plans at a scale of at least 1:1000. 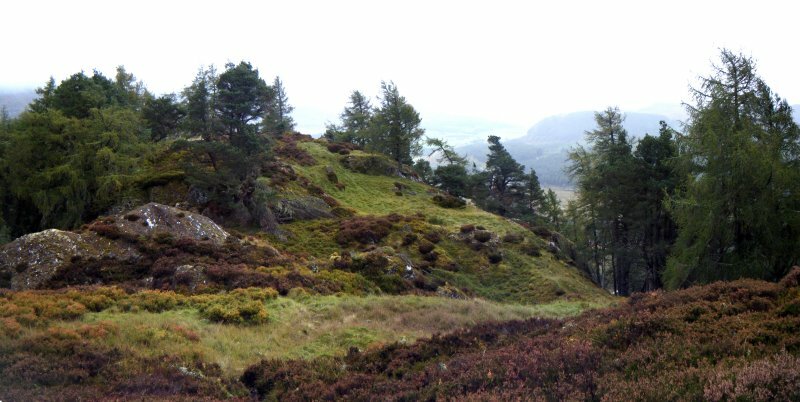 Two of the forts, Caisteal Mac Tuathal and Tor Dhuin are covered by dense bracken and its removal would significantly improve the appearance of these forts. 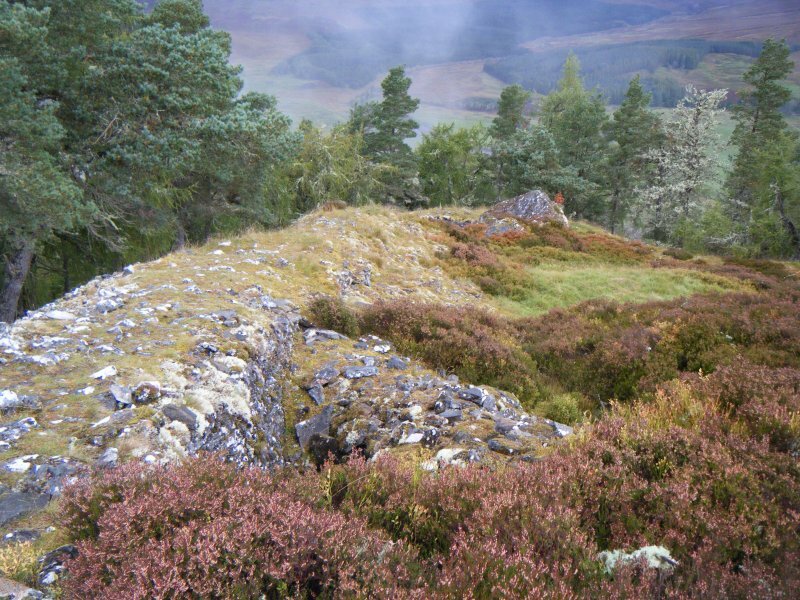 This fort is situated on the rocky summit (465m OD) of a spur that forms the NE end of the Black Craig ridge. 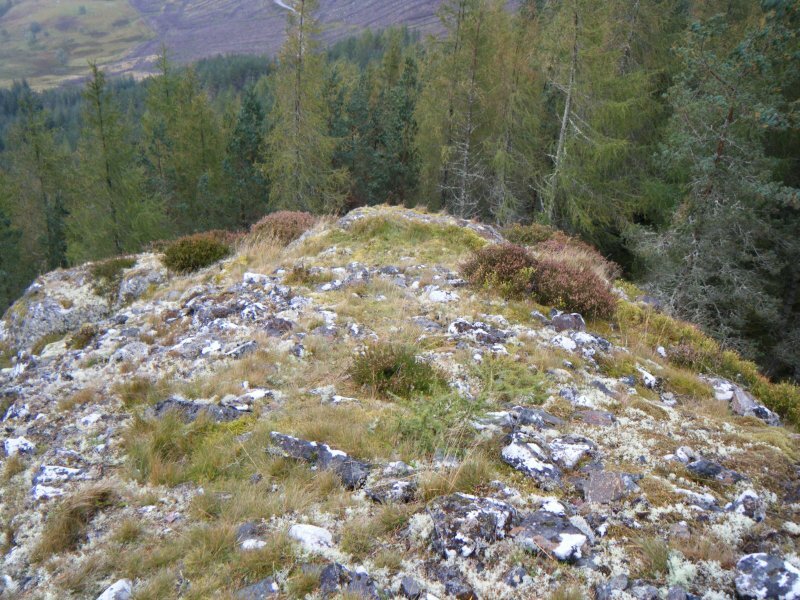 The defences, a single wall, follow the edge of the summit area, which rises into two rocky bosses at either end, to form an irregular enclosure measuring internally some 110m in length from NE to SW and contracting in breadth from 75m where it faces onto the saddle with Black Craig on the SW to 32m at its mid-point, before tapering to a point on the NE. 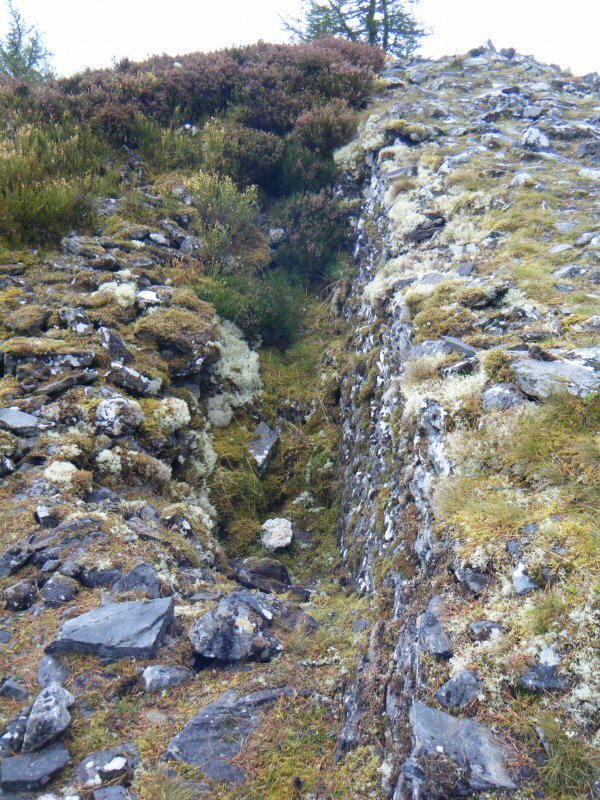 The wall itself is up to 7.5m in thickness, but typically from 4m to 5m, with long runs of well-built inner and outer faces employing thin slabs no more than 0.1m thick and in places standing between 2m and 3m in height. 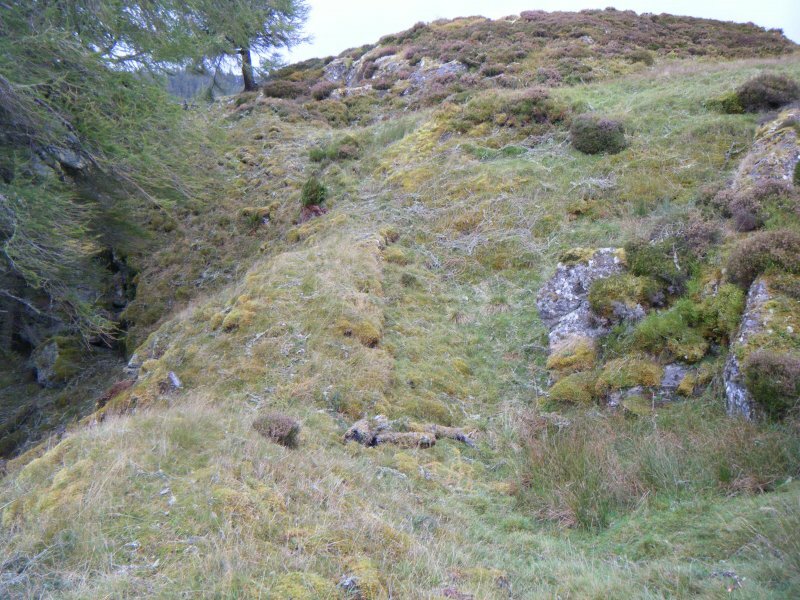 These higher sections have been deliberately exposed, a change in the character of the upper masonry of the inner face at the NW corner suggesting a certain amount of reconstruction. 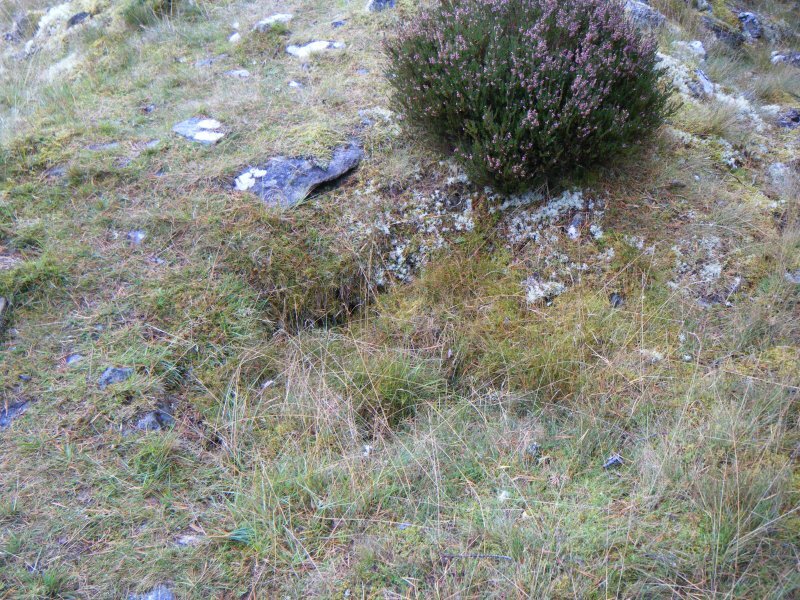 The position of the entrance is uncertain, though there is a gap in the wall in the middle of the NW side. 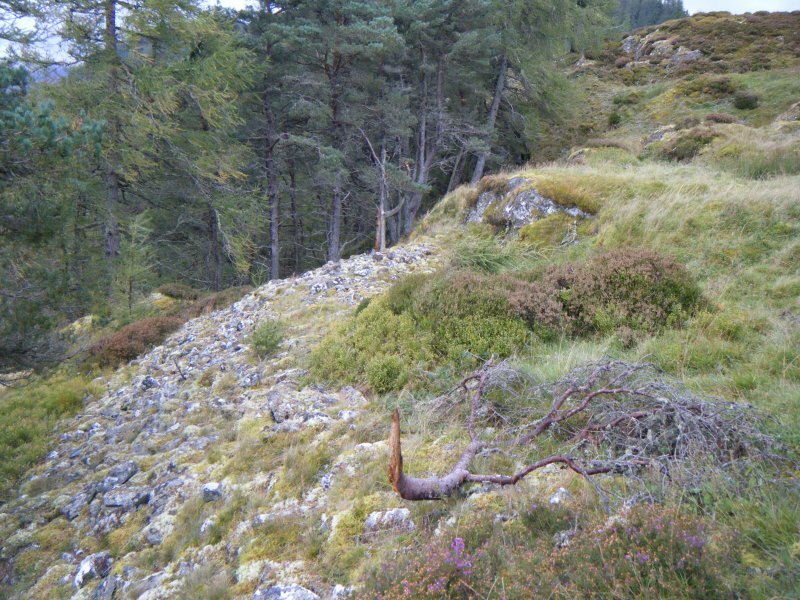 The interior presents a series of rocky shelves and terraces which would have provided suitable stances for timber buildings. 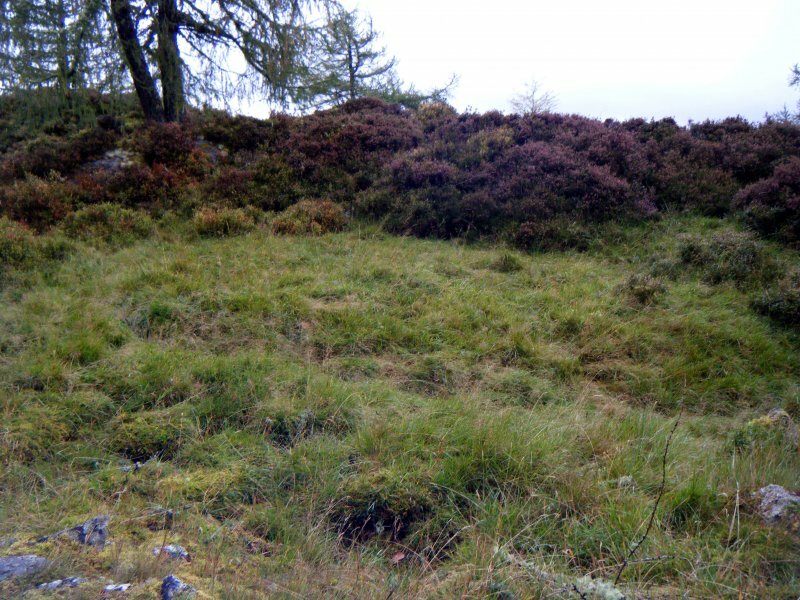 The only other features appear to be the result of more recent activity, including dugouts probably built by the Home Guard in WW2, a couple of small shelters, a possible twinning pen, and three marker cairns standing on the wall on the NE. 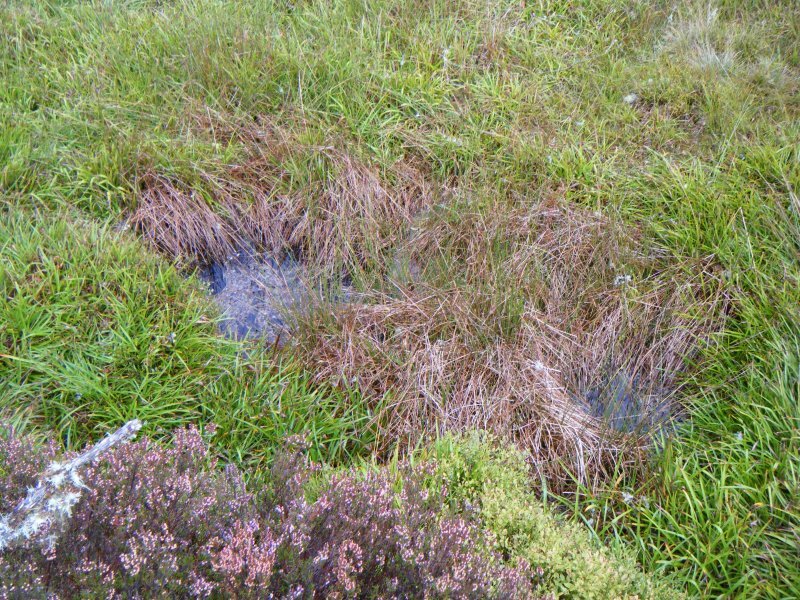 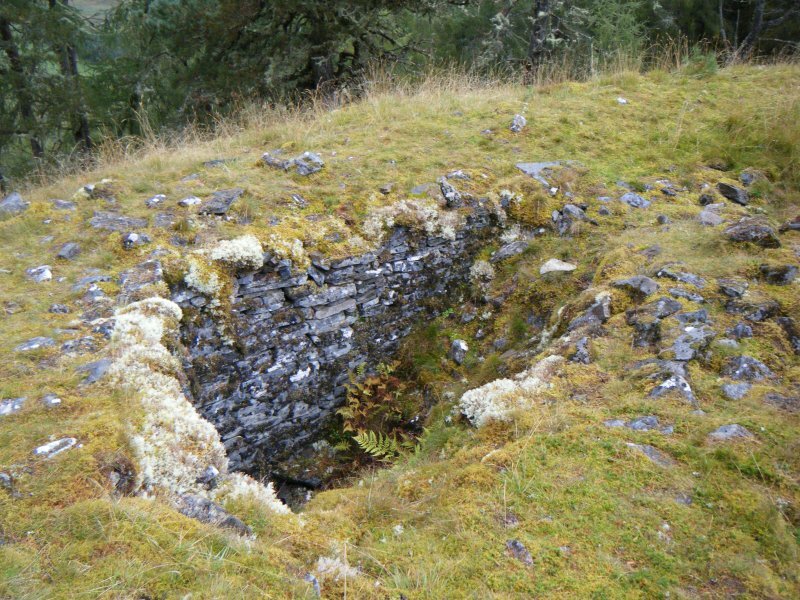 There is also a small well in the NW part of the interior and though a survey by Headland Archaeology in 2010 suggested that it may be relatively recent, it does appear on the plan by the Rev Mackintosh Mackay dawn up about 1832 (Mackay 1857); it does not appear on a plan drawn up in 1956 by Richard Feachem.